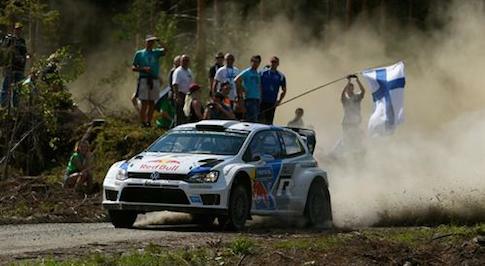 The Volkswagen Polo R WRC proved its metal this weekend winning the FIA World Rally Championship Rally Finland. It was also a great day for Jari-Matti Latvala and Miikka Anttila, who became the first Finnish duo to triumph in their home event in four years. Latvala and Anttila won the rally in the Polo R WRC in what proved to be a veritable thriller all the way to the finishing line, clinching victory over their teammates S�bastien Ogier and Julien Ingrassia by just 3.6 seconds. Volkswagen's excellent team success in the toughest rally of the year was rounded off by Andreas Mikkelsen and Ola Fl�ene who finished in fourth place overall. The rally known as 'Formula 1 in the forest' marks the twelfth consecutive rally win for the Wolfsburg-based team, and is also its eighth win in the current season. Ahead of Rally Germany, Volkswagen is poised to clinch all three WRC championship titles  for the manufacturer, the driver and the co-driver. Dr Heinz-Jakob Neu�er, Volkswagen Board Member for Technical Development said: "It's been a fantastic weekend at Rally Finland. Both Jari-Matti Latvala and S�bastien Ogier dominated 25 of the 26 special stages and the final day of the rally couldn't have been more exciting. "There was no knowing who would actually win the rally until they finally crossed the line. The Power Stage once again demonstrated what the team and the Polo R WRC are capable of. We are very happy with the result in Finland and congratulate Jari-Matti Latvala and Miikka Anttila on this huge success in front of a home crowd."